Our thirst for bloodshed is mostly slaked by your blades and incantations; the time for the Saga's sunset is at hand. The Saga of Blood reaches its conclusion the morning (EST) of February 19, 2018. We know you might have some questions about what that entails; please refer to [this FAQ] for details. First, the Saga-exclusive Hoard of Blood is going away when Saga of Blood closes. Remember, the contents of these hoards can be smuggled to Fury and traded after the merge! Additionally, all other Hoards will be removed on February 19th–BUT, they'll be on sale until then, so now's the time to stock up! 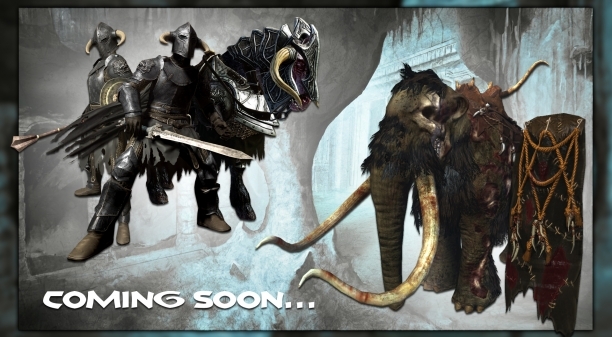 On February 19th, a brand-new Hoard with new items and artwork will mark its debut: From the furthest reaches of the Exiled Lands, the Silent Legion's ghastly, haunted presence invades Age of Conan! And after that…well, you'll just have to wait and see! © 2012 Funcom. All rights reserved. © 2012 Conan Properties International LLC ("CPI"). CONAN, CONAN THE BARBARIAN, HYBORIA, and/or ROBERT E. HOWARD and related logos, characters, names, and distinctive likenesses thereof are trademarks or registered trademarks of CPI and/or Robert E. Howard Properties Inc. unless otherwise noted. All Rights Reserved. Funcom authorized user.